The preshow music was golden oldie soul — James Brown, Booker T. & the M.G. 's — and the band came onstage while Michael Jackson's "Don't Stop Till You Get Enough" blasted through the house PA. Whether the song choice was deliberate or not, it set a pretty weird tone for the traditional country show we were about to witness. 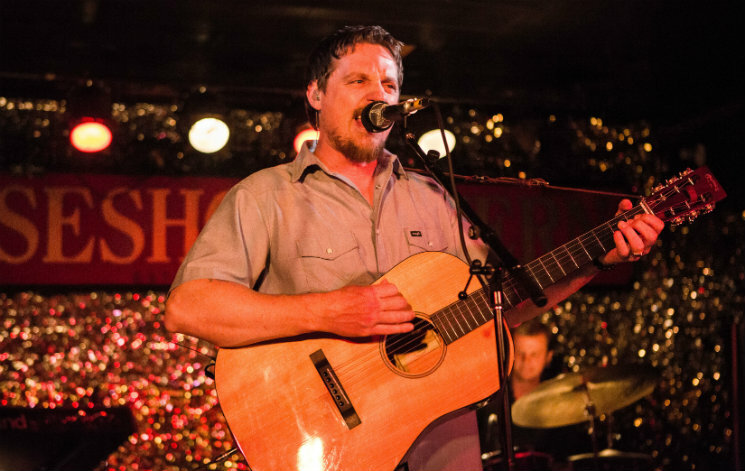 But, thing is, that's Sturgill Simpson all over: traditional, but off-kilter in disarming ways. Here is a marble-mouthed country singer from Kentucky who covers synth pop songs, who sings about Buddhism and space lizards, and yet whose sound is in almost every way grounded in the country music that was on the radio several years before he was born. Progressive ideas wearing traditional garb, Simpson's songs are both comfortingly familiar and thrillingly innovative. Live, Simpson is a monster. Growling and hooting his way through a lengthy, energetic set, he and his terrific band transformed the venerable Horseshoe Tavern from Queen Street oasis to backcountry roadhouse. By about the quarter mark of the set, following a ferocious, extended take on "Long White Line," the place was heaving and swaying, and hot as all flaming hell. It never cooled. His gravelly vocals weaving in and out of Laur Joamets' astonishingly quick guitar licks, Simpson ran through virtually his entire recorded catalogue before offering up a half-speed standout cover of Terry Allen's indelible "Amarillo Highway" to wind down the set. He closed with his unlikely cult hit, "Turtles All The Way Down," an ode to the transformative power of hallucinogenic insight, and a refusal of mainstream religion in favour of a kind of hippie mysticism. And we all sang along. These are the "metamodern sounds" of country music, he told us. Sounds about right to me.